Three Texas cities are facing serious questions about how much to alter local statutes in order to persuade Uber, an app-based vehicle-for-hire company, to continue operating. A screenshot of the Uber app in Midland, provided by Public Information Officer Sara Bustilloz. Citing "burdensome regulations," Uber ended service in Midland and Galveston on Monday. On Tuesday, Austin city officials debated how to move forward after a political action committee — largely funded by Uber and its top competitor, Lyft — submitted enough voter signatures to challenge a new ordinance the companies have argued will force them to leave that city as well. Uber has grown exponentially in cities across Texas over the last year, prompting local officials to draft regulations on the company's drivers similar to those already in place for local taxis. Both Uber and Lyft have repeatedly pushed back, threatening to leave cities that do not loosen up on rules for vehicle-for-hire companies. "I don't like the position that we're in," Adler said, citing concerns that the council will be forced to choose one of two options instead of finding an "innovative" solution to the problem. Councilwoman Delia Garza said she did not want the council to accept the less-restrictive ordinance on Ridesharing Works for Austin's petition, citing concerns that signatures were collected with signers being told, "your city council is trying to ban Uber." “I have to speak to the broader issue of this company steamrolling through local cities and governments,” Garza said. “This has been a huge distraction, and I think we can do the easy thing or we can do the right thing. I think the right thing is to let the voters decide." Uber's position in Austin is at odds with its policy in Houston, where vehicle-for-hire drivers must undergo a mandatory fingerprint-based background check. While Lyft withdrew from Houston largely over that issue, Uber has continued to operate. Sarfraz Maredia, Uber's general manager over Houston, declined to say Tuesday why the company wouldn't accept the same policy in Austin. "It has become clear that Houston is the outlier in how it has chosen to regulate," Maredia said. "The rest of our markets have focused on passing modern ride-sharing regulations. As a result, our expansion strategy in Texas has changed to focus on launching only in markets that are consistent with that policy." While Uber's fate in Austin remains in limbo, the company was more firm with Galveston and Midland. On Monday, Uber abruptly ceased services in both cities, citing regulations passed by the cities' councils. Maredia said the company had collectively signed up about 1,000 active drivers in the two cities over the last year. Lyft does not currently operate in either city. Midland officials, in particular, were baffled by Uber's decision. Sara Bustilloz, a city spokeswoman, said Midland's City Council passed an ordinance for vehicle-for-hire app drivers in December but agreed to make significant changes after Uber contacted them with a list of conditions for staying in the city. The council met all of Uber's requests and allowed the company to send a master list of driver information to use for licensing, a process that Bustilloz said, "comes down to emailing an Excel spreadsheet." “They have since indicated that that’s the part of the ordinance they don’t like, and they requested it,” Bustilloz said. “So we’re a little confused as far as that goes. If they’re going to say something will work for them and then later say it doesn’t, that makes it hard." 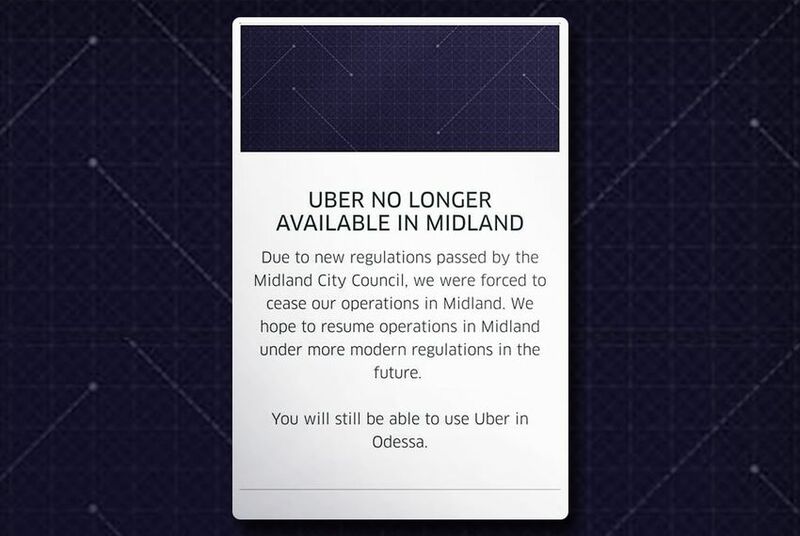 People in Midland who attempt to use the Uber app are now shown a message from the company criticizing the city council. The message, as displayed in a screenshot sent to The Texas Tribune by Bustilloz, says the company hopes to return to the city "under more modern regulations in the future." Bustilloz said the city is confused about Uber's motivations, considering the compromises they made on their ordinances, and is unsure of its next steps. "We do not have anything in our ordinance that another city does not have," she said. "If they’re able to operate in Dallas and Houston, I don’t see why they can’t operate here or why our ordinance isn’t good enough." The company pulled its operations from Galveston days after its city council passed an ordinance calling for Uber drivers to apply for chauffeurs' licenses, as well as requiring vehicle-for-hire app firms themselves to apply for operators' licenses. "More recently, we've seen Galveston pass regulations that are clear outliers from the national consensus," Maredia said, again citing Uber's new strategy to focus on cities that, "embrace the benefits of ride-sharing rather than rules that are protecting outdated, taxi-like regulations." Disclosure: Uber and Lyft are corporate sponsors of The Texas Tribune. Steve Adler is a major donor and former board chairman of The Texas Tribune. A complete list of Tribune donors and sponsors can be viewed here.